The United Nations has established a right to the truth to be enjoyed by victims of gross violations of human rights. The origins of the right stem from the need to provide victims and relatives of the missing with a right to know what happened. It encompasses the verification and full public disclosure of the facts associated with the crimes from which they or their relatives suffered. The importance of the right to the truth is based on the belief that, by disclosing the truth, the suffering of victims is alleviated. 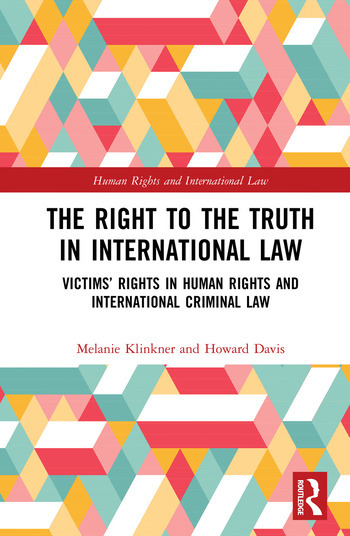 This book analyses the emergence of this right, as a response to an understanding of the needs of victims, through to its development and application in two particular legal contexts: international human rights law and international criminal justice. The book examines in detail the application of the right through the case law and jurisprudence of international tribunals in the human rights and also the criminal justice context, as well as looking at its place in transitional justice. The theoretical foundations of the right to the truth are considered as well as the various objectives appropriate for different truth-seeking mechanisms. The book then goes on to discuss to what extent it can be understood, constructed and applied as a hard, legally enforceable right with correlating duties on various people and institutions including state agencies, prosecutors and judges. Melanie Klinkner is a Principal Academic in International Law at Bournemouth University, UK. Howard Davis is Reader In Public Law at Bournemouth University, UK.